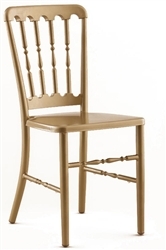 GOLD VERSAILLES METAL CHAIR .• Save time and money – reduced maintenance time.• Meets or exceeds ANSI/BIFMA Safety Standards.• Perfect for the indoor and outdoor events. Gold Metal Versailles Chairs are inspired by the highest quality and offer highest resistance. Chairs successfully tested to 2000+ lbs. in a static load test. Affordable Versailes Chairs weigh 8.3 lbs,.100% steel and aluminum welded, Ships Fully Assembled with Premium UV treated paint equals to less fading and discoloration.i Chairs are made for indoor and outdoor use. Gold Metal Versailles Chairs are inspired by the highest quality and offer highest resistance. Chairs successfully tested to 2000+ lbs. in a static load test. Affordable Versailles Chairs weigh 8.3 lbs,. 100% steel and aluminum welded, Ships Fully Assembled with Premium UV treated paint equals to less fading and discoloration. Chairs are made for indoor and outdoor use. 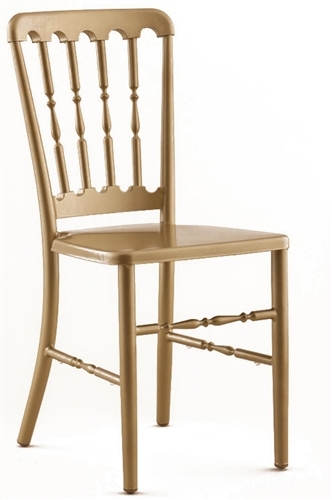 Metal Gold Versailles Chairs are inspired by the highest quality and offer highest resistance. Chairs successfully tested to 2000+ lbs. in a static load test. Affordable Versailies Chairs weigh 8.3 lbs,.100% steel and aluminum welded, Ships Fully Assembled with Premium UV treated paint equals to less fading and discoloration.i Chairs are made for indoor and outdoor use.